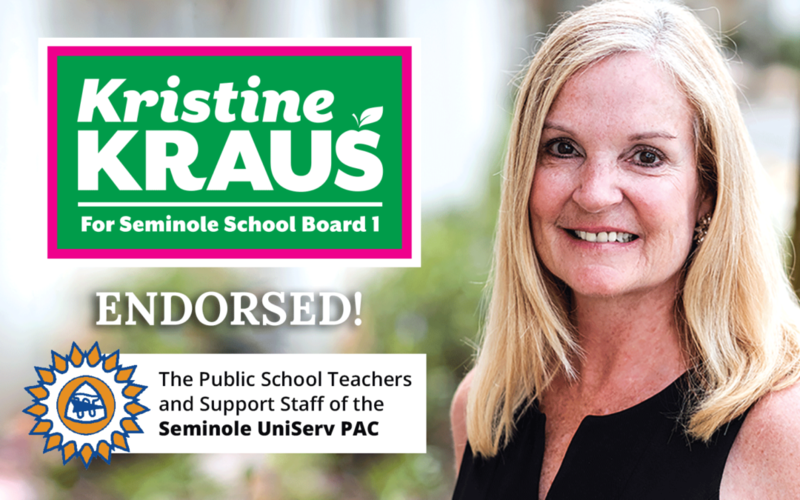 Seminole UniServ has endorsed Kristine Kraus for Seminole County School Board. “I am grateful for the support of Seminole UniServ and proud to receive the endorsement of thousands of teachers and staff.” said Kraus. Seminole UniServ is the umbrella organization of four local public-school Unions; Seminole Education Association (SEA), Seminole Education Clerical Association (SECA), Seminole County School Bus Drivers Association (SCSBDA), and Non-Instructional Personnel of Seminole County (NIPSCO). Kristine Kraus believes in ensuring equal educational opportunity for all students, supporting teachers and staff; school safety, and providing adequate funding for the maintenance and operation of public schools, Public tax dollars for Public Schools.